The plugin is based on a useful library Taxonomy_Single_Term created by WebDevStudios, I found it when I did the research work on creating Categories Metabox Enhanced. 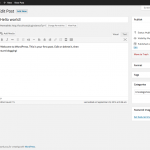 For it’s not actually a WordPress plugin and only hosted on GitHub, I decided to integrated it to the plugin and implemented the options on the Settings. Please note that if there are multiple categories have been set for a post, after activated this plugin, there are only one category can be displayed as checked in Radio option type. A neat plugin although there are others with the same functionality. An enhancement for the categories metabox I’ve often needed but never been able to find is a series of groups with radio buttons permitting only one selection from each group. We do some work with school news blogs where the author is required to make selections of a few categories – is this a featured post, what grade or year level does it apply to, and what academic subject ? 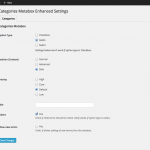 With the correct selections the posts appears in the right places on the site, but it’s confusing for the user to be presented with a long list of choices in a metabox. Using parent/child categories helps but still allows multiple selections in the child categories. These can all be covered with custom fields of course but that adds an extra layer of complication and makes theme changing by the clients difficult. How about creating custom taxonomies (as groups) and apply the single term UI to them with my plugin? It might meet your expectation but will need extra work to convert current categories to them. Hey David, a 5-star review on wp.org would be great to me. Thanks for your support! Hi! Good job! Thaks a lot! Every time when i use your plugin i have to add manually https://harvesthq.github.io/chosen/ Chosen style for Select view of category metabox… Because i all cases when i use your plugin my clients have a huge list of terms. Who know, may be you need to add this function basically. Chosen style with search of cause i mean… thnx! Hey Alex, thanks for the suggestion. I’ll see if I can integrate it in the future release.